﻿﻿Students in the Business Law Clinic program are not lawyers and therefore they are not licensed to give legal opinions. Students can only provide information about business law issues as they relate to business planning and operations. The clinic does not provide information regarding family law, administrative law, criminal law or litigation. 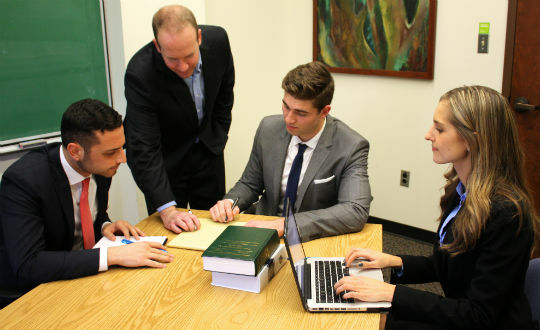 The Business Law Clinic has been in operation since 1998. It is staffed by upper-year UVic Law students who have a demonstrated interest in providing business law services to the community. Through their studies and extracurricular activities at UVic Law, these students have clearly expressed an interest in corporate law and small business operations and in helping British Columbia's entrepreneurs achieve their business goals. UVic Law's Business Law Clinic course (LAW 349) gives students an opportunity to develop their legal skills and understand the lawyer's role in facilitating business transactions for clients, all within a clinical context. They also learn about client interviewing, problem-solving, legal research, legal analysis and ethical issues. Local practising lawyers are actively involved in the operation of the BLC. They volunteer their time to assist clinic students in analyzing legal issues. They also direct the students' research activities. If you are a lawyer who would like to become a mentor, please contact the BLC for more information. The BLC's services are available to a wide range of business owners, entrepreneurs and non-profit organizations that operate within British Columbia. The clinic assists individuals who have questions about business legal issues. These services are provided year-round, except for the months of April, August and December. If you require business law information or assistance, please leave a message with the Business Law Clinic at 250-472-4522 or send an email to blc@uvic.ca. A BLC representative will reply to your message as soon as possible. If your particular issue or legal question suits the objectives of the program, the clinic will schedule an interview so you can discuss your situation with a UVic Law student. Please bring to the interview any documents that you feel are relevant to the type of legal information or assistance you are seeking. The assigned student will then research your legal issues. He or she will then prepare a reporting letter that will include answers to your questions. "I would like to take this opportunity to thank the Business Law Clinic for providing concise, relevant research and information regarding my legal query. As a small business owner in British Columbia, it can be daunting trying to correctly interpret contracts and the law as it applies to your own circumstance and operation. The report you prepared gave me a better understanding of how the courts have previously ruled on similar cases and applicable precedents. It will also be helpful to my lawyer and will save time when working on my behalf, thus saving me money." "Thank you so much for this letter. Your writing on copyright is very clear and extremely thorough... I am now better informed and certainly more confident approaching this discussion with the advice you have given." "A note of thanks for your terrific work at the UVic Business Law Clinic. I very much appreciate all of your hard work and research on (my) project. I received your memo and found the legal information to be incredibly helpful to me. I especially appreciated your investigation and review in the process for formation of a not-for-profit society..."
Michael Litchfield teaches the Business Law Clinic course (LAW 349) at the University of Victoria Faculty of Law and is the director of the Business Law Clinic program. Michael has enjoyed a varied career as a corporate lawyer and management consultant including time spent with a national firm in Vancouver, establishing a corporate/commercial law corporation in the interior of British Columbia and most recently founding a management consulting firm, Thinklab Consulting Inc. Michael's current practice involves the provision of strategic management and project management advice to clients in a wide range of industries. In addition to his professional practice, Michael is also a sought after speaker who is regularly called upon to speak about topics relating to both law and management. He is a regular columnist on practice management issues for the legal blog SLAW and has contributed articles to The Lawyers Weekly, BarTalk and Canadian Lawyer magazine. The Business Law Clinic's services are available to individuals with business law issues within British Columbia. Clients living in and around Victoria are interviewed in person at the University of Victoria Faculty of Law, while those living in other communities can be interviewed by telephone. For more information or to book an appointment, please leave a message on the BLC's voicemail at 250-472-4522, send an email to blc@uvic.ca or send a fax to 250-721-8146. To obtain contact information for the University of Victoria Faculty of Law (including a campus map, courier address and regular mail address), please visit the UVic Law contact page. The Faculty of Law would like to acknowledge the funding contribution of Western Economic Diversification Canada in the creation and development of the Business Law Clinic in its early years of operation. UVic Law also extends its sincere thanks to business lawyers in Vancouver and Victoria who have so generously volunteered their time to act as mentors to students enrolled in the Business Law Clinic program.